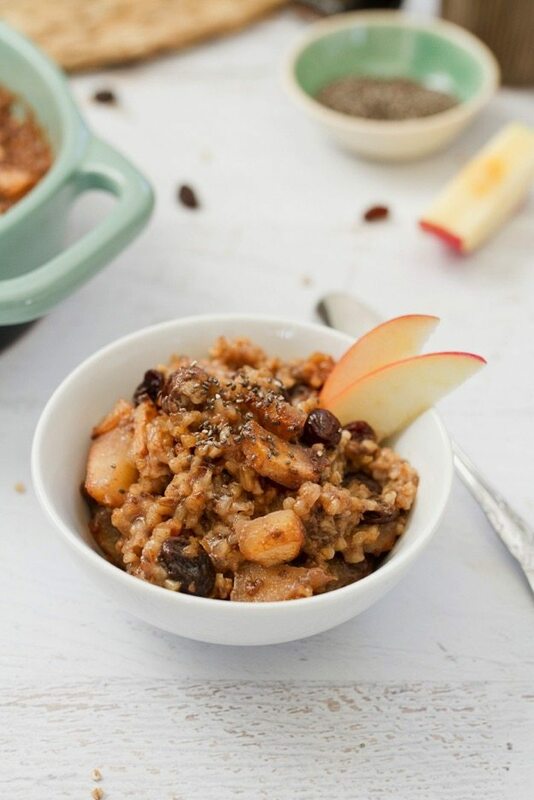 This apple cinnamon baked steel cut oatmeal recipe is a lovely make-ahead breakfast option for busy mornings. Studded with sweet apple chunks, raisins and cinnamon, these oats will satisfy your taste-buds and keep you feeling full all morning. Morning friends! How’s your weekend going? Ours has been full of snow — piles of it! Flakes started falling on Friday morning and didn’t let up until late Saturday. At one point I didn’t think it would ever stop. We’re hunkered down, spending a lot of time inside getting cozy and a little time outside playing. The cold weather has me on a warm breakfast kick and my favorite as of late has been baked oatmeal. After making this Maple Pecan Baked Oatmeal Isaac requested a version without nuts so I started brainstorming. He loves raisins so I took that idea and ran with it. The result was a baked oatmeal with apple chunks and plump raisins nestled throughout. 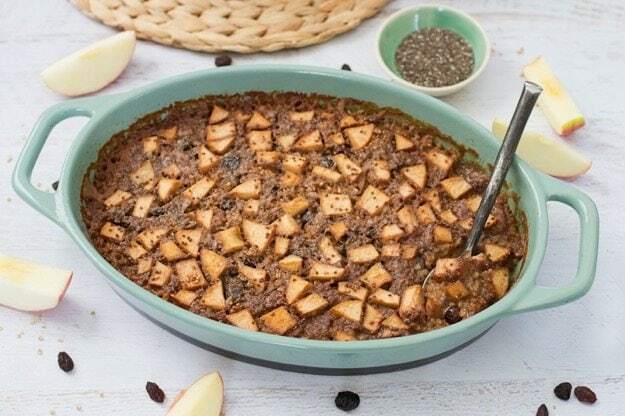 Doesn’t it look pretty with all the apple bites and chia seeds on top? 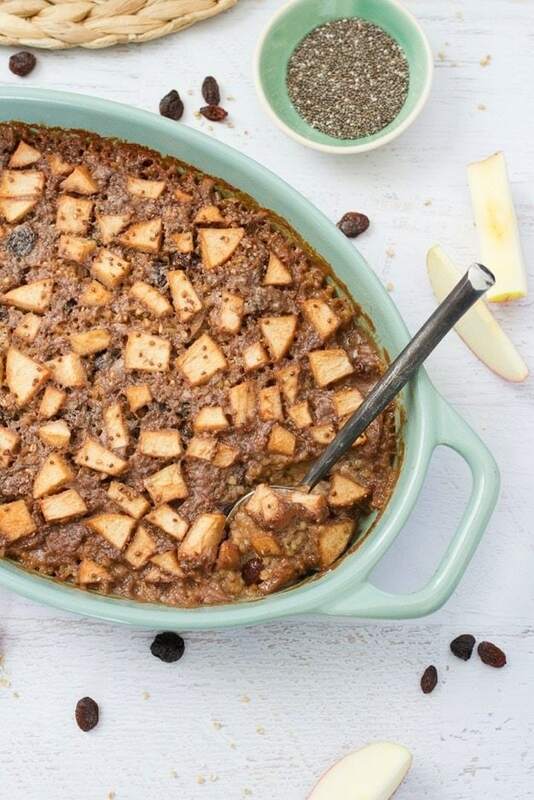 The combo of oats, apples, raisins, a little maple syrup and a dash of cinnamon makes for a naturally sweet and delicious healthy oatmeal bake. This version is particularly nutritious because I used steel cut oats. They’re the least processed of all oats and have an awesome chewy texture. Other healthy ingredients include chia seeds, coconut oil and almondmilk, which makes the recipe vegan and gluten-free! If eating a healthy breakfast was one of your New Year’s resolutions this baked oatmeal is pretty much the perfect fit. You can make a batch over the weekend and you’ll be set with an easy breakfast for the week (or at least most of it). Reheating the baked oatmeal is a breeze, either using the microwave or stove-top. Although I have to tell ya, I’ve found that the oats are really good eaten cold as well. I just add an extra splash of almond milk and eat them like overnight oats or muesli. Yum! 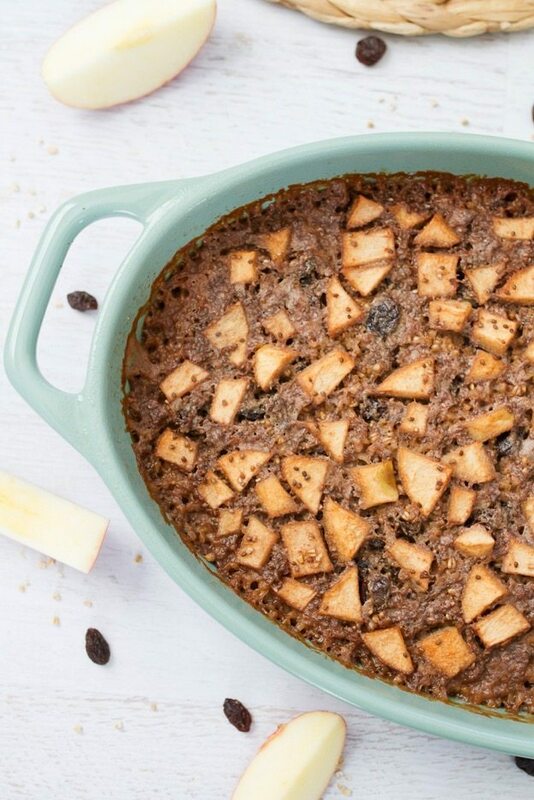 If you’re a baked apple lover you will adore this baked oatmeal. Trust me on this one. The apples get extra sweet, soft and are coated with cinnamon. It reminds me of apple pie, which is perfection because apple pie is my fav. Isaac absolutely loved this version and thought the sweetness was perfect. If you’re trying to cut back on sugar or just prefer things mildly sweetened, you can easily reduce the maple syrup and raisins a bit. It won’t affect the end result, the oats will just be a little less sweet. Enjoy! 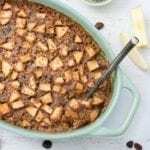 If you make this apple cinnamon baked steel cut oatmeal be sure to leave a comment and star rating below letting us know how it turned out. Your feedback is so helpful for the EBF team and our readers! Combine chia seeds with water to make a chia egg and let sit for a few minutes. In a large mixing bowl combine oats, maple syrup, chia egg, coconut oil, cinnamon, vanilla and sea salt. Stir well to combine. Add in almond milk, apple chunks and raisins. Stir everything together once more. Place oatmeal mixture into a greased baking dish (an 8×8 square baking dish or something similar). Bake in the oven for 50-60 minutes or until oatmeal is golden brown and the center is cooked through. Remove from the oven, let cool and enjoy. Place any leftovers in a sealed container in the fridge. Reheat later and enjoy. To make this recipe with old fashioned rolled oats, use 2 cups of rolled oats instead of 1 cup of steel cut oats and reduce the baking time to 35 – 40 minutes. For a lower sugar version, reduce the amount of maple syrup and raisins or omit them completely. This looks delicious! I will definitely be trying this out later next week. Also, that baking dish is so pretty – who makes it? Thanks for the great recipe! Hi Brittany. Just wondering what kind of apple you used and if you have any recommendations. I’m going to try the recipe, but replace the raisins with an equal amount of pecans (sort of a hybrid with your maple pecan oatmeal recipe). Hi Jen. I used a Pink Lady, mainly just because they’re one of my favorites and it’s what I had on hand. I’d recommend using a sweet variety like Pink Lady, Fuji or something similar. Let me know how it turns out with the pecans instead of raisins! I haven’t tried baked oatmeal with steel cut oats before. Great idea! Thanks Amanda. I usually skip making steel-cut oats because they take a while to cook on the stove-top. Baking them is perfect because once you have the full batch cooked you can reheat them quickly! Just made this for the week ahead. Not only does my apartment smell wonderful, but the dish tastes just as good. Thanks for the recipe! 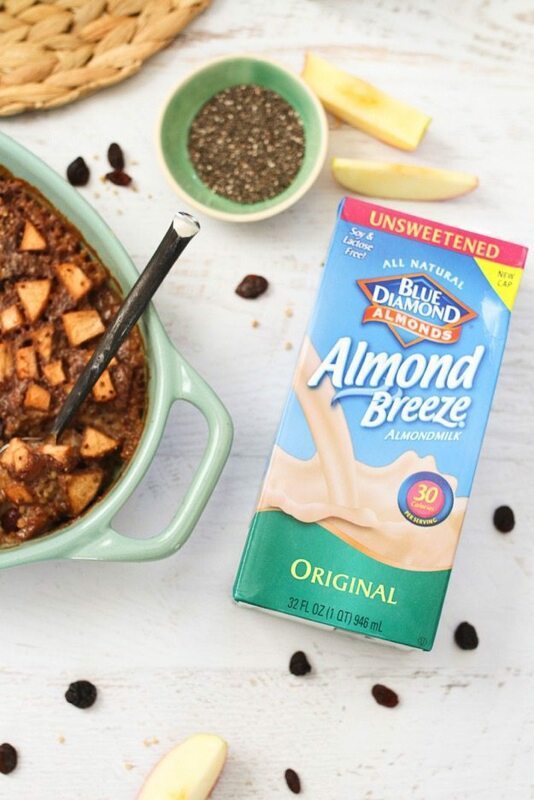 Love that this is naturally sweetened! apple and cinnamon are the best 🙂 Looks great! 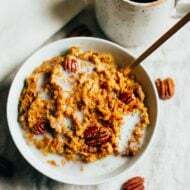 I’ve been making variations on the maple pecan baked oatmeal since you posted that recipe, and it’s delicious, easy, tastes great hot OR cold. 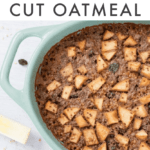 I’ve been wondering how to use steel cut oats in what ratio since I have plenty on hand from a local farm, and you’ve just made my day with this option! I rarely send comments but this is absolutely delicious. I have actually eaten this as a snack portion in the afternoon – eating it cold. Extremely satisfying. I will bake again at Christmas when I have all my family here and serve hot/warm for breakfast. Looks delish! You could easily omit the chia seeds right? I don’t have any on hand and want to make it! ???? Yes! You could use ground flaxseed if you have that or 1 egg, but I think the recipe will still turn out even if you simply omit the chia seeds and water. Thanks!!! And thanks for the super quick response, I’ll let you know how it turns out! 🙂 Love steel cut oats!! I’ve made this many times without the chia seeds and it’s just fine. Is there something that could be used instead is coconut oil? It’s so expensive here! Do you need to soak the oatmeal overnight? I’ve seen several other bake recipes that also say soak overnight. You don’t need to soak the steel cut oats overnight! 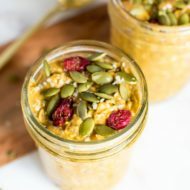 Could you do your slow cooker pumpkin pie oats with this method? Hi Kirstin! I bet it would work just fine! Let me know if you try it! I don’t usually like oats but am trying different recipes to eat them for breakfast and this turned out delicious! Thank you so much for the recipe, I wrote in my personal book of favorite recipes! If using the ground flaxseed, would you still add the water? Also, could honey be equally substituted for the maple syrup or would you use less honey? Thanks! Yes! I’d mix the ground flax with the water to create a “flax egg” just as suggested in the recipe with the chia seeds. And yes, honey for maple should be fine. And I’d use the same amount — about 1/4 cup! This is one of my gotos for meal prep for breakfast. It’s delicious! I generally hate the consistency of Oatmeal, but this is the exception. I made it with unsweetened Silk Cashew milk today and it’s very good! This makes me so happy to hear, Nicole! Thanks for sharing. Is it ok to use quick cook steel cut oats with this recipe? CM how did it come out with the quick cooking oats? How long did you leave them in for? I just put mine in and just realized I’m just the quick cooking ones!! Chrissy — how did it turn out and how long did it take for the oatmeal to bake through? Hi…just made this today. Used gluten free steel cut oats and cranberries instead of raisins and added 1/4 cup of chopped walnuts. Love it!!! This will be my favorite breakfast! Can you use regular oatmeal instead? Hi Rebecca! It should definitely work but you’ll likely need to cook it for less time… maybe around 30-40 minutes. I have a similar recipe for regular baked oatmeal that you could add apples to! 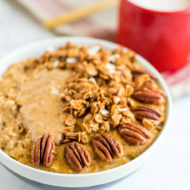 It’s here (https://www.eatingbirdfood.com/maple-pecan-baked-oatmeal/) if you want to check it out. Absolutly delicious, best breakfast ever! I skipped the raisins and used water instead of almond milk, and it turned out great! Thanks for the recipe! Ahh! This makes me so happy. Glad you enjoyed it, Pauline! I made this last night, but I used an actual egg and omitted the raisins. I keep it in the oven for more like 80-90 minutes, and it turned out great! I reheated in the microwave for 30 seconds the next morning, and it was delicious!!! One of my new favorite oatmeal recipes!! A fabulous way to cook steel cut oats. I have been making this about every week/other week over the fall and into winter. I don’t have time in the mornings before work to cook them, but making this recipe allows for leftovers (if there are any because the bf eats nearly the whole pan!) which reheat great and maintains texture. I like the texture of the oatmeal in this bake vs slow cooker versions. Could you cook this muffin style? If so, how long would I cook them? Trying to come up with a quick grab and go breakfast for hubby who leaves for work 3 hours before me!